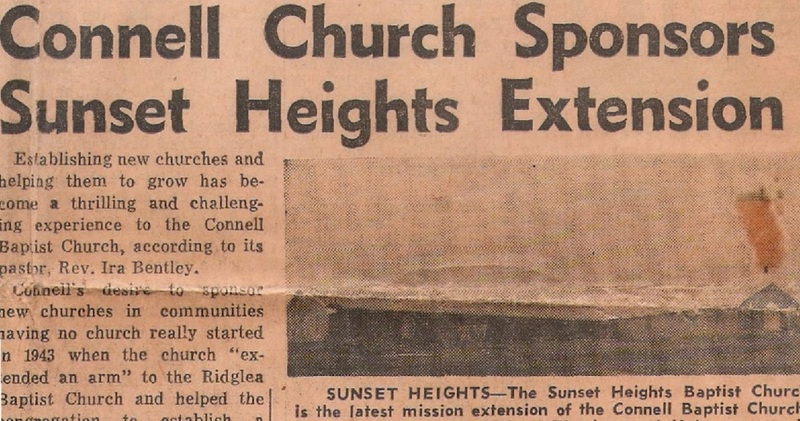 Hulen Street Church began as Sunset Heights Baptist Church in 1959. Although many things are now different, we are still a church of people willing to do anything to reach others with the gospel. To see more about each phase of our church history, simply click on the appropriate year. Hulen Street Church began in 1959 as Sunset Heights Baptist Church, a church plant of Connell Baptist Church in Fort Worth, TX. The people of Connell Baptist realized there was a growing community in Fort Worth and saw the potential for more people to know the love of God. Through a series of tent meetings, Sunset Heights Baptist Church became a reality, with people becoming disciples of Jesus and becoming family with one another. The church eventually changed their name to Hulen Street Baptist Church to reflect their immediate location. As the years passed, the church began to see the need to move to the rapidly-growing Candleridge area of southwest Fort Worth. Pastor Josef Solc led the challenge to sell their property near Hulen Street and Interstate 30, and buy the Hulen Street Tennis Club, located just south of Hulen Street and Altamesa Boulevard. Many within the church were skeptical or unwilling to change locations, so much so that 90% of the church members found another church to be a part of. The 10% that remained resolved to see Hulen Street Baptist Church reach people in southwest Fort Worth for the gospel. Within the first two years of moving to their new location, Hulen Street Baptist Church began to see amazing growth, ministering to many within the community. They opened their tennis courts and swimming pool to the public and began making in-roads to the nearby Candleridge community for the gospel. After one of the church's buildings burned down, the people of Hulen Street saw a major opportunity to respond to the continued growth they had experienced. They decided to rebuild the old building, and expand the other building that sat upon the 14-acre property. Through an initiative called The Gathering, the church raised the money to rebuild the burned down building and add a Worship Center in the process. In 2010, Hulen Street went through many changes all at once: calling a new Lead Pastor, new staff, and beginning a new direction toward making and maturing disciples. Additionally, the name was changed to Hulen Street Church. In 2012, we began an initiative called Paving the Way, a call to expand God's Kingdom: first through a missions partnership with Awaken Church in London, and secondly by adding a new entrance and Growth Group rooms to our church building. In 2016, we began another initiative called The Next Step. Learn more about The Next Step.